Hilltop Setting in the Heart of Evergreen. Timbervale is one of the more sought after neighborhoods overlooking Hiwan Homestead Park and conveniently located to shops and restaurants and downtown Evergreen. This solidly built home was designed to take advantage of the sun and treetop views. Three enclosed sun rooms on three levels provide warmth, solar value and views of the meadow. Gleaming hardwood floors cascade throughout the main and upper levels. The penthouse master suite with high vaulted ceilings and birds eye views is the perfect place to end the day. The living room with a floor to ceiling stone fireplace and vaulted dining together create a wonderful gathering room for family and friends. Easy access to the galley style kitchen offers plenty of counter space and cabinet storage including a walk-in pantry. 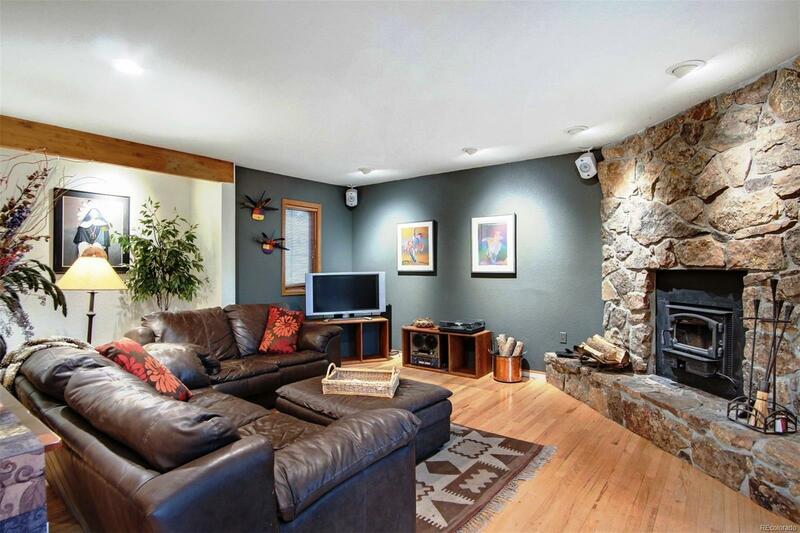 The wood floors lead to a spacious game or media room with a T&G ceiling and wet bar. The walkout lower level has two additional bedrooms and an updated full bath.